Characters from across four counties converged on Baron Pride Night to provide spirited support for all of Manheim Central High School's varsity sports. 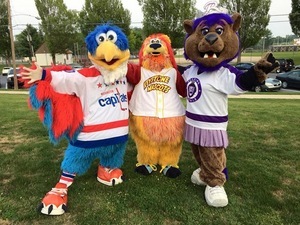 Joining the over 500 Baron fans were Tiara from the Reading Royals, Boomer the Thundercat, Winger the Eagle (original Washington Capitals mascot) and Keystone Mascots' character creation, Baron Stiegel. We're looking forward to all of our clients' mascot characters leading their teams to victory on the field and off. ....and remember, even if you're not a Keystone Mascots character we'll clean, repair, and even train your mascot to be the best for your organization!